Guys, this blog post has been weeks in the making. I've been opening and closing the tab because I just couldn't get the words right but I think I've procrastinated over this for long enough! In today's blog post, I'll be chatting about The Force Awakens, the newest addition to the Star Wars universe. I'm the girl who booked her tickets for the 17th December 00:01 showing in October so to say I was invested in this film would be an understatement. 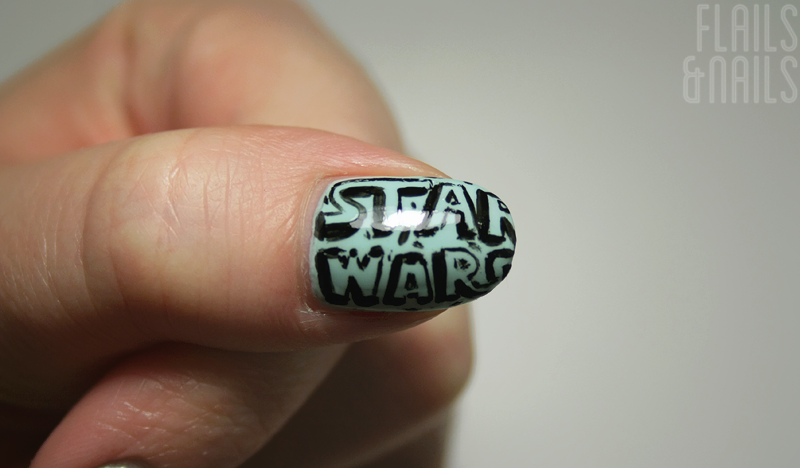 Join me under the cut to read my thoughts on the film as well as some details on my Star Wars themed nail art. Minor spoilers ahead but I'm not being a jerk and revealing the big things, I'm better than that! The Force Awakens takes place 30 years after the events of Return of the Jedi and follows a whole new horde of characters; Rey, a junker from Jakku, Finn, a rogue Stormtrooper who's had a change of conscience, and Poe Dameron, the best pilot in the Resistance. As well as new faces, a few familiar ones pop up to help out the new guys. The Empire has fallen and in its place The First Order has risen. The Resistance, a Republic sponsored army of sorts, not too dissimilar to the Rebel Alliance, is tasked with quashing the threat of the First Order. Like I said before, I don't want to get into too many details so I'll move on to my thoughts on the film. The Force Awakens is a long time coming. At first, a lot of fans were sceptical due to the prequels but when it was revealed that JJ Abrams was heading the project, confidence kind of grew since he is a fan of the franchise itself and let's be honest, he kinda knows what he's doing (Star Trek reboot anyone?) One of my favourite things about the film was the creative decision by Abrams to shoot on 35mm film, as well as the use of practical effects. 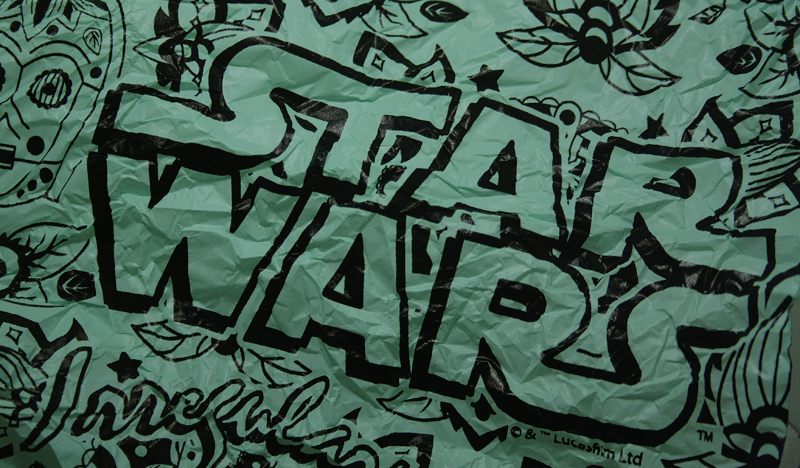 The prequels have been criticised for being too digital, that the grit of the original three films were lost because of a need to showcase the newest and best technology available in the SFX and CGI world. The Force Awakens embraces the original trilogy's look and feel and although the vast majority of audiences around the world will see the digitalization of the original 35mm reels, you can tell its been shot on film. It's such a hipster thing to say but by using 35mm, Abrams gave The Force Awakens a sense of depth and reality that I don't think would be possible on digital. For a film set a long, long time ago in a galaxy far, far away, a touch of reality can make all the difference in drawing an audience in; if a film looks too polished, its hard to immerse yourself in the world when everything looks so new and fake. In terms of practical effects, I'll just leave this snippet from the Force for Change launch and you should see what I'm talking about. Drawing on the fact that The Force Awakens is much more akin to the original films, a few people have criticised the film for its overwhelming similarities to A New Hope. While the similarities between the two films cannot be ignored, I personally do not think the film is derivative of A New Hope but rather has drawn parallels between the two stories to help ease the transition between the old and new films. Also, in terms of narrative, A New Hope follows the standard Hero's journey, as does The Force Awakens. This narrative structure is by no means an original concept but has been featured in literature for centuries. The two films feature different characters with different goals and this allows The Force Awakens to stand out as an independent entity in terms of narrative. While established characters from the Star Wars universe feature quite a bit in The Force Awakens, our new protagonists are mainly made up of up-and-coming actors. Performances across the board were fantastic. Daisy Ridley as Rey portrays the character with such confidence that it's unbelievable that she has only had bit parts previous to this film. The strength of Rey as a character really inspires me in terms of the characterization of women within the universe. Finn, played by John Boyega, brings with him a lot of the comic relief in the film but when the time comes, he doesn't stray from showing emotion during those high drama moments. He's complemented by Oscar Issac as Poe Dameron. Their friendship will probably be pne of the highlights of the entire new set of films and I can't wait to see it develop. I'd be here all day if I went into any sort of detail regarding all of the characters in the film but I have to say, Adam Driver as Kylo Ren was fantastic. Since The Force Awakens was shrouded in such mystery, the complexity of Kylo Ren came as a surprise and Driver conveyed the inner conflict of the character amazingly. I look forward to seeing more from Gwedoline Christie as Captain Phasma and Domhnall Gleeson as General Hux in the next films. The Force Awakens lived up to the hype. It conjured up nostalgia with its references to the original trilogy but it is very much a modern film with its use of digital and practical effects. I'm looking forward to reading all of the novels that have been released that go into more detail surrounding the main protagonists, as well as in-depth character studies of secondary characters that feature for only a minute or two. 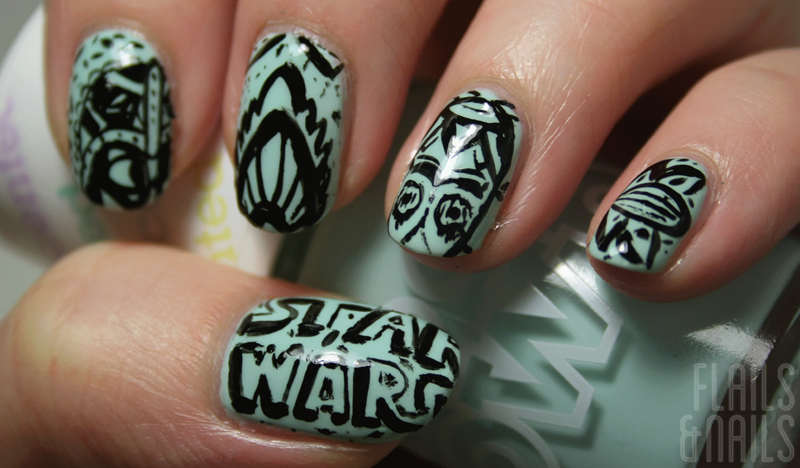 Now, if wordy reviews aren't your thing, here's my nail art which is loosely based around Star Wars. 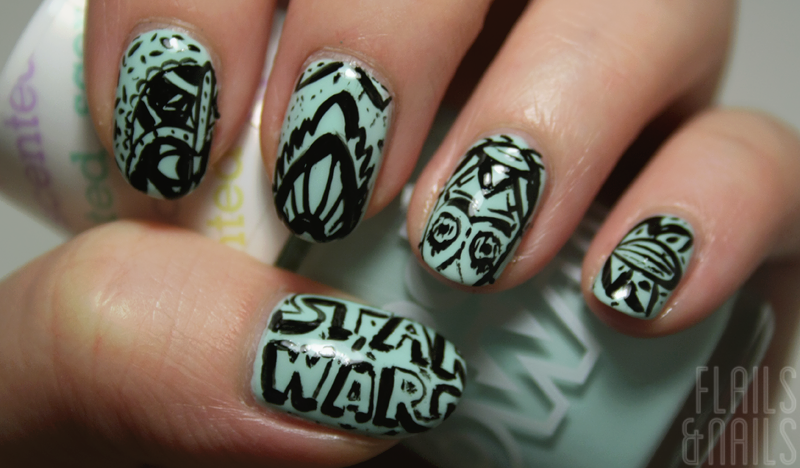 For this manicure, I used the tissue paper that came with my Irregular Choice Star Wars flats (if you follow me on Instagram, you would have seen these). 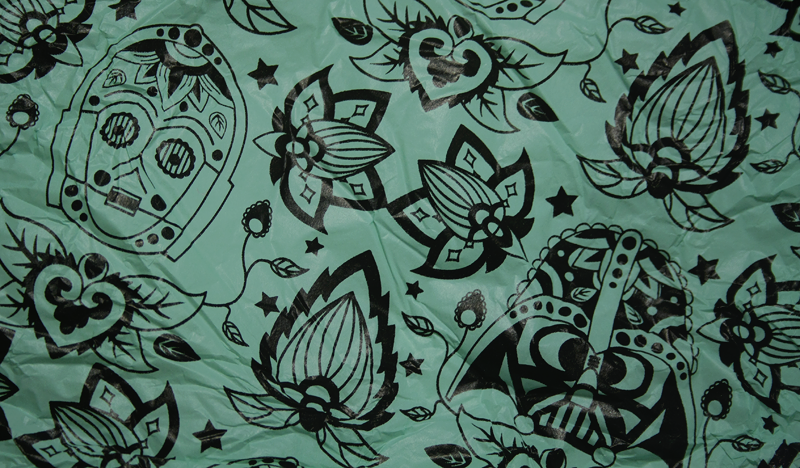 The tissue paper is this gorgeous mint green shade with cool stylized Darth Vader and C-3PO heads and other filigree. Models Own Apple Pie is the perfect match for the tissue paper and I used black polish for all the detail. All of the detail work was hand done and took a good chunk of time because I haven't done any intricate nail art for a WHILE. I'm really proud of most of my digits (C-3PO looks like he's been in the desert too long) but I spent way too long on them, I'll even admit that but I've been itching to do these nails ever since I saw the tissue paper. I hope I get to do more of these sort of movie reviews/nail posts. I find it hard to find a balance between academic talk and being too casual but I hope you enjoy the post and aren't too overwhelmed.